Definition of NAICS Sector 81: The Other Services (except Public Administration) sector comprises establishments engaged in providing services not specifically provided for elsewhere in the classification system. Establishments in this sector are primarily engaged in activities such as equipment and machinery repairing, promoting or administering religious activities, grantmaking, advocacy, and providing drycleaning and laundry services, personal care services, death care services, pet care services, photofinishing services, temporary parking services, and dating services. Private households that engage in employing workers on or about the premises in activities primarily concerned with the operation of the household are included in this sector. Excluded from this sector are establishments primarily engaged in retailing new equipment and also performing repairs and general maintenance on equipment. These establishments are classified in Sector 44-45, Retail Trade. NAICS codes are broken down by digit. The broadest description starts with the 2 digit sector codes. The 3 digit subsector codes are more specific, then the 4 digit industry group, 5 digit industry, and the most specific is the 6 digit NAICS code. If NAICS Sector 81 does not describe the industry of the business in question, then select the largest applicable code below. From there, follow the progression of smaller digits to the larger digits in order to obtain the most specific 6 digit classification. Definition of NAICS Sector 72: The Accommodation and Food Services sector comprises establishments providing customers with lodging and/or preparing meals, snacks, and beverages for immediate consumption. The sector includes both accommodation and food services establishments because the two activities are often combined at the same establishment. NAICS codes are broken down by digit. The broadest description starts with the 2 digit sector codes. The 3 digit subsector codes are more specific, then the 4 digit industry group, 5 digit industry, and the most specific is the 6 digit NAICS code. 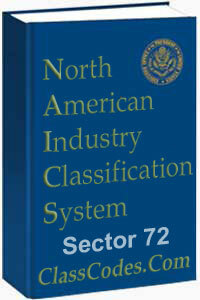 If NAICS Sector 72 does not describe the industry of the business in question, then select the largest applicable code below. From there, follow the progression of smaller digits to the larger digits in order to obtain the most specific 6 digit classification. Establishments that operate facilities or provide services that enable patrons to participate in recreational activities or pursue amusement, hobby, and leisure-time interests. Establishments using transportation equipment to provide recreational and entertainment services, such as those operating sightseeing buses, dinner cruises, or helicopter rides, are classified in Subsector 487, Scenic and Sightseeing Transportation. NAICS codes are broken down by digit. The broadest description starts with the 2 digit sector codes. The 3 digit subsector codes are more specific, then the 4 digit industry group, 5 digit industry, and the most specific is the 6 digit NAICS code. If NAICS Sector 71 does not describe the industry of the business in question, then select the largest applicable code below. From there, follow the progression of smaller digits to the larger digits in order to obtain the most specific 6 digit classification. Definition of NAICS Sector 62:The Health Care and Social Assistance sector comprises establishments providing health care and social assistance for individuals. The sector includes both health care and social assistance because it is sometimes difficult to distinguish between the boundaries of these two activities. The industries in this sector are arranged on a continuum starting with those establishments providing medical care exclusively, continuing with those providing health care and social assistance, and finally finishing with those providing only social assistance. The services provided by establishments in this sector are delivered by trained professionals. All industries in the sector share this commonality of process, namely, labor inputs of health practitioners or social workers with the requisite expertise. Many of the industries in the sector are defined based on the educational degree held by the practitioners included in the industry. Excluded from this sector are aerobic classes in Subsector 713, Amusement, Gambling, and Recreation Industries and nonmedical diet and weight reducing centers in Subsector 812, Personal and Laundry Services. Although these can be viewed as health services, these services are not typically delivered by health practitioners. NAICS codes are broken down by digit. The broadest description starts with the 2 digit sector codes. The 3 digit subsector codes are more specific, then the 4 digit industry group, 5 digit industry, and the most specific is the 6 digit NAICS code. If NAICS Sector 62 does not describe the industry of the business in question, then select the largest applicable code below. From there, follow the progression of smaller digits to the larger digits in order to obtain the most specific 6 digit classification. Definition of NAICS Sector 61: The Educational Services sector comprises establishments that provide instruction and training in a wide variety of subjects. This instruction and training is provided by specialized establishments, such as schools, colleges, universities, and training centers. These establishments may be privately owned and operated for profit or not for profit, or they may be publicly owned and operated. They may also offer food and/or accommodation services to their students. Educational services are usually delivered by teachers or instructors that explain, tell, demonstrate, supervise, and direct learning. Instruction is imparted in diverse settings, such as educational institutions, the workplace, or the home, and through diverse means, such as correspondence, television, the Internet, or other electronic and distance learning methods. The training provided by these establishments may include the use of simulators and simulation methods. It can be adapted to the particular needs of the students, for example sign language can replace verbal language for teaching students with hearing impairments. All industries in the sector share this commonality of process, namely, labor inputs of instructors with the requisite subject matter expertise and teaching ability. NAICS codes are broken down by digit. The broadest description starts with the 2 digit sector codes. The 3 digit subsector codes are more specific, then the 4 digit industry group, 5 digit industry, and the most specific is the 6 digit NAICS code. If NAICS Sector 61 does not describe the industry of the business in question, then select the largest applicable code below. From there, follow the progression of smaller digits to the larger digits in order to obtain the most specific 6 digit classification. Definition of NAICS Sector 56: The Administrative and Support and Waste Management and Remediation Services sector comprises establishments performing routine support activities for the day-to-day operations of other organizations. These essential activities are often undertaken in-house by establishments in many sectors of the economy. The establishments in this sector specialize in one or more of these support activities and provide these services to clients in a variety of industries and, in some cases, to households. Activities performed include: office administration, hiring and placing of personnel, document preparation and similar clerical services, solicitation, collection, security and surveillance services, cleaning, and waste disposal services. The administrative and management activities performed by establishments in this sector are typically on a contract or fee basis. These activities may also be performed by establishments that are part of the company or enterprise. However, establishments involved in administering, overseeing, and managing other establishments of the company or enterprise are classified in Sector 55, Management of Companies and Enterprises. Establishments in Sector 55, Management of Companies and Enterprises normally undertake the strategic and organizational planning and decision making role of the company or enterprise. Government establishments engaged in administering, overseeing, and managing governmental programs are classified in Sector 92, Public Administration. NAICS codes are broken down by digit. The broadest description starts with the 2 digit sector codes. The 3 digit subsector codes are more specific, then the 4 digit industry group, 5 digit industry, and the most specific is the 6 digit NAICS code. If NAICS Sector 56 does not describe the industry of the business in question, then select the largest applicable code below. From there, follow the progression of smaller digits to the larger digits in order to obtain the most specific 6 digit classification. Establishments (except government establishments) that administer, oversee, and manage establishments of the company or enterprise and that normally undertake the strategic or organizational planning and decision making role of the company or enterprise. Establishments that administer, oversee, and manage may hold the securities of the company or enterprise. Establishments in this sector perform essential activities that are often undertaken in-house by establishments in many sectors of the economy. By consolidating the performance of these activities of the enterprise at one establishment, economies of scale are achieved. Government establishments primarily engaged in administering, overseeing, and managing governmental programs are classified in Sector 92, Public Administration. Establishments primarily engaged in providing a range of day-to-day office administrative services, such as financial planning, billing and recordkeeping, personnel, and physical distribution and logistics are classified in Industry 56111, Office Administrative Services. NAICS codes are broken down by digit. The broadest description starts with the 2 digit sector codes. The 3 digit subsector codes are more specific, then the 4 digit industry group, 5 digit industry, and the most specific is the 6 digit NAICS code. If NAICS Sector 55 does not describe the industry of the business in question, then select the largest applicable code below. From there, follow the progression of smaller digits to the larger digits in order to obtain the most specific 6 digit classification. Definition of NAICS Sector 54: The Professional, Scientific, and Technical Services sector comprises establishments that specialize in performing professional, scientific, and technical activities for others. These activities require a high degree of expertise and training. The establishments in this sector specialize according to expertise and provide these services to clients in a variety of industries and, in some cases, to households. Activities performed include: legal advice and representation; accounting, bookkeeping, and payroll services; architectural, engineering, and specialized design services; computer services; consulting services; research services; advertising services; photographic services; translation and interpretation services; veterinary services; and other professional, scientific, and technical services. This sector excludes establishments primarily engaged in providing a range of day-to-day office administrative services, such as financial planning, billing and recordkeeping, personnel, and physical distribution and logistics. These establishments are classified in Sector 56, Administrative and Support and Waste Management and Remediation Services. NAICS codes are broken down by digit. The broadest description starts with the 2 digit sector codes. The 3 digit subsector codes are more specific, then the 4 digit industry group, 5 digit industry, and the most specific is the 6 digit NAICS code. If NAICS Sector 54 does not describe the industry of the business in question, then select the largest applicable code below. From there, follow the progression of smaller digits to the larger digits in order to obtain the most specific 6 digit classification. Definition of NAICS Sector 53: The Real Estate and Rental and Leasing sector comprises establishments primarily engaged in renting, leasing, or otherwise allowing the use of tangible or intangible assets, and establishments providing related services. The major portion of this sector comprises establishments that rent, lease, or otherwise allow the use of their own assets by others. The assets may be tangible, as is the case of real estate and equipment, or intangible, as is the case with patents and trademarks. This sector also includes establishments primarily engaged in managing real estate for others, selling, renting and/or buying real estate for others, and appraising real estate. These activities are closely related to this sector’s main activity, and it was felt that from a production basis they would best be included here. In addition, a substantial proportion of property management is self-performed by lessors. Excluded from this sector are establishments primarily engaged in renting or leasing equipment with operators. Establishments renting or leasing equipment with operators are classified in various subsectors of NAICS depending on the nature of the services provided (e.g., transportation, construction, agriculture). These activities are excluded from this sector because the client is paying for the expertise and knowledge of the equipment operator, in addition to the rental of the equipment. In many cases, such as the rental of heavy construction equipment, the operator is essential to operate the equipment. NAICS codes are broken down by digit. The broadest description starts with the 2 digit sector codes. The 3 digit subsector codes are more specific, then the 4 digit industry group, 5 digit industry, and the most specific is the 6 digit NAICS code. If NAICS Sector 53 does not describe the industry of the business in question, then select the largest applicable code below. From there, follow the progression of smaller digits to the larger digits in order to obtain the most specific 6 digit classification. Raising funds by taking deposits and/or issuing securities and, in the process, incurring liabilities. Establishments engaged in this activity use raised funds to acquire financial assets by making loans and/or purchasing securities. Putting themselves at risk, they channel funds from lenders to borrowers and transform or repackage the funds with respect to maturity, scale, and risk. This activity is known as financial intermediation. Establishments engaged in activities that facilitate, or are otherwise related to, that type of financial or insurance intermediation. Industries within this sector are defined in terms of activities for which a production process can be specified, and many of these activities are not exclusive to a particular type of financial institution. To deal with the varied activities taking place within existing financial institutions, the approach is to split these institutions into components performing specialized services. This requires defining the units engaged in providing those services and developing procedures that allow for their delineation. These units are the equivalents for finance and insurance of the establishments defined for other industries. The Finance and Insurance sector has been defined to encompass establishments primarily engaged in financial transactions; that is, transactions involving the creation, liquidation, change in ownership of financial assets; or in facilitating financial transactions. Financial industries are extensive users of electronic means for facilitating the verification of financial balances, authorizing transactions, transferring funds to and from transactors’ accounts, notifying banks (or credit card issuers) of the individual transactions, and providing daily summaries. Since these transaction processing activities are integral to the production of finance and insurance services, establishments that principally provide a financial transaction processing service are classified to this sector, rather than to the data processing industry in the Information sector. NAICS codes are broken down by digit. The broadest description starts with the 2 digit sector codes. The 3 digit subsector codes are more specific, then the 4 digit industry group, 5 digit industry, and the most specific is the 6 digit NAICS code. If NAICS Sector 52 does not describe the industry of the business in question, then select the largest applicable code below. From there, follow the progression of smaller digits to the larger digits in order to obtain the most specific 6 digit classification.